In March of 2013, we elicited short abstracts on cross-linguistic studies of language understanding and production, with a particular focus on languages that are understudied in this regard. We received an incredible 69 submissions, representing work on a broad variety of languages. After an initial round of reviews, we invited 17 teams to submit papers, of which 13 are now appearing in this special issue. I guess this must make this one of the most competitive special issues out there ;). These thirteen papers cover research on Basque, Cantonese, Paraguayan Guaraní (a Tupí-Guaraní language spoken in Paraguay), Kaqchikel (a Mayan language spoken in Guatemala), Khalkha Mongolian, Maltese (the only semitic language written with a Latin alphabet), Mandarin, Palenquero (a Spanish-based creole), Rarámuri (an Uto-Aztecan language spoken in Mexico), Setswana (a Bantu language spoken in southern Africa), Turkish, Tzeltal (a Mayan language spoken in southern Mexico), Vietnamese, and comparative studies of some of these languages contrasted with Dutch, English, or Spanish. In a 2009 review of cross-linguistic work on sentence production, Lis Norcliffe and I estimated that sizeable amounts of quantitative studies existed for only seven out of an estimated 5000 languages. Six of these language are Indo-European and have been spoken in close geo-cultural proximity for many centuries. As several of the papers in this special issue beautifully demonstrate, testing theories about language processing against an independent sample of languages is critical for the development of mature, broad-coverage psycholinguistic theories. The reasons for this include linguistic and cultural differences (though the papers in our issue focus on the former). As we further outline in our introduction to the special issue (Norcliffe, Harris, & Jaeger), the often implicit universality assumption underlying many theoretical proposals should not be assumed — it needs to be tested. Sometimes doing so can radically change our understanding of language processing. One example that I personally find a rather striking illustration of this related to the principles that underlie incremental sentence production. Countless papers have appealed –and continue to appeal– to the strikingly intuitive notion that short constituents are ordered before longer ones because the production system is ‘opportunistic’, ordering what is easy to plan and produce earlier in the sentence. The production system might well implement such efficient encoding strategies, thereby supporting fluency, etc. However, the assumption that this hypothetical bias underlies word order preferences is challenged by data from languages, which systematically show the opposite long-before-short bias (see, e.g., Ros et al in this issue on Basque; Fedzechkina et al on miniature language production; and earlier work by Choi 2007 on Korean, Yamashita and colleagues 2001 and onwards on Japanese). To me, examples like these (for further examples, see our introduction) mean that the field would benefit from an increased effort to validate its theories against cross-linguistic data. This also means, I’d suggest, that we as editors and reviewers should be accepting that sometimes testing a theory against a language that is typologically different from what has been studied before will confirm what we believed before (phew ;)). I understand why such a paper might sound less exciting — confirmation becomes uninformative at some point. I would submit, however, that most psycholinguistic theories are far from the point at which cross-linguistic validation should be taken for granted (as also illustrated by several of the papers in this issue). Cross-linguistic psycholinguistics can also play a critical role beyond validation: as several papers in this special issue demonstrate, working on languages that are structurally completely different from the usual suspects, raises novel questions, prompts different perspectives, and might highlight previously unrecognized commonalities across lines of research. We are extremely grateful to the authors and reviewers who made this issue possible. Many of them truly went beyond what can be expected. Some papers in our issue underwent five rounds of revisions, with feedback from linguistic and psycholinguistic experts, reflecting the additional challenges that come with cross-linguistic research. Several authors added additional experiments, making their papers even more convincing, reviewers went out of their way to help with the analyses and presentation, etc. We deeply appreciate this dedication to the field. 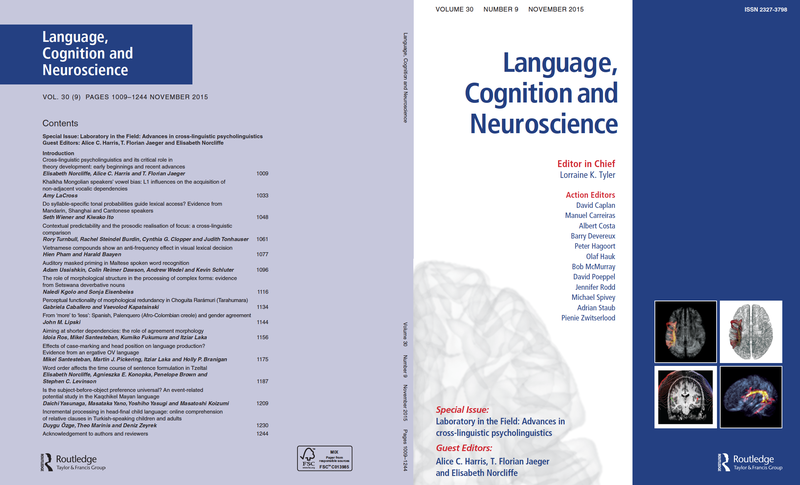 In closing, we hope that this special issue helps to illustrate the powerful role that cross-linguistic research can play in advancing psycholinguistics. As is clear from the sheer number of submissions we received, there is an increased interest in this type of research (the introduction to this issue was downloaded 1000 times within two weeks of posting it, perhaps also because of the beautiful historical overview that Lis Norcliffe wrote). Such work comes with its own unique challenges. It requires special training, novel support structures, additional funding, etc. But most of all, it probably will benefit from reviewers and editors showing an understanding of the intricacies inherent to such work. For what it’s worth, judging purely from own experience (mostly as a reviewer), this is increasingly the case.